1) The curse of inactivity, obesity, and other factors for older people. 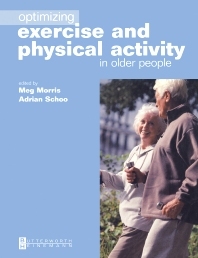 2) Evidence for the effectiveness of physical activity & exercise interventions in the elderly. 1) Why physical activity and exercise need continuation. 3) Physical activity and exercise in the health management of adults, the old, and the very old. 4) Lifestyle, nutrition and other factors that could assist physical activity, health and well-being. 10) Prescribed physical activity and exercise in the management of osteoarthritis. a)First-aid procedures after musculoskeletal injuries. c) How to calculate ideal weight. d) The ideal heart rate during exercise. e) How to measure heart rate. f) List of relevant adherence factors in the areas of physical activity and exercise. g) References for health professionals. h) educational material that can be understood by persons with lower levels of literacy and that can be copied by the health professional. These handouts can be used to assist in the management of specific chronic conditions or to facilitate exercise adherence.